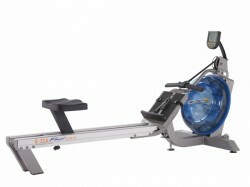 The First Degree rowing machine Fluid Rower E520 with HRK has a water resistance system for authentic rowing workouts. Basic resistance is variable in 20 levels. The durable construction can be loaded up to 204 kg and is also suitable for professional use. The training computer informs you about all important training data and is equipped with a heart rate receiver. The First Degree rowing machine Fluid Rower E520 with HRK can be connected to your pc via a USB interface. Watch statistics of your workout and use monitor for displaying training data. Realistic resistance production per water resistance; basic resistance can be varied 20 times while rowing. In addition, resistance regulates automatically according to power of stroke: the stronger you pull, the stronger gets the resistance. 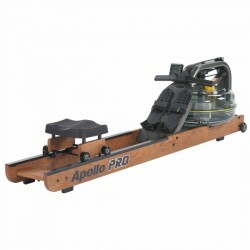 The Apollo Pro II is a professional rowing machine with water resistance and a stable frame made of American ashwood and steel. 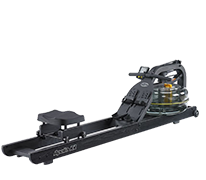 The First Degree Fitness rowing machine Apollo Pro II has a comparably small set-up space, practical transport wheels, and is equipped with a self-cleaning mechanism of the rail. The indoor rower is maintenance-low and durable. The First Degree Fitness Apollo Plus combines a silent, precious slide rail made of American ash wood with a steel frame. The rowing machine with water resistance offers a top-quality training movement and high stability. 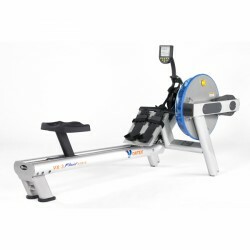 Purchasing the First Degree rowing machine Fluidrower VX-3, you get a sturdy and durable equipment with a load capacity of up to 204 kg, which is excellent for ambitious workouts. 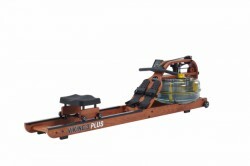 The rowing machine is equipped with a water tank resistance system conveying an authentic rowing sensation. Thanks to extra long aluminium seat rail, even taller rowers can comfortably use the First Degree rowing machine Fluidrower VX-3. 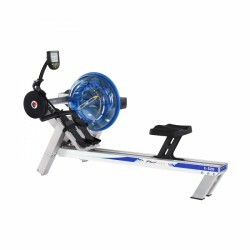 The First Degree rowing machine Fluid Rower E316 with HRK has a water resistance system for a realistic rowing workout. The basic resistance is variable in 16 levels. The weight loadability of 204 kg makes the First Degree rowing machine Fluid Rower E316 with HRK suitable for professional use as well. Seat and ergonomic pull rod provide comfort. The new training pc displays all important data and offers the possibilitiy to connect the Fluid Rower to your PC. Use your monitor for displaying data and watch statistics of your workout. The First Degree Apollo Plus Black Edition sets exceptional quality standards. How? From the successful combination of: Robust frame construction made of out a combination of steel & americanisch ash wood, realistic rowing feeling thanks to the (adjustable) resistance through water and a timeless modern Black Edition design, which in Germany is exclusively available at T-Fitness. 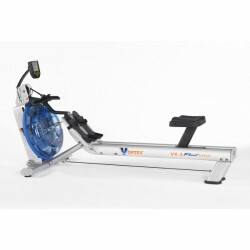 The First Degree rowing machine Vortex VX-2 is a sturdy fitness equipment for professional use and performance-oriented athletes. The Fluid system with water tank offers an authentic training. The First Degree rowing machine Vortex VX-2 can also be used by taller athletes thanks to its long seat rail. Comfort is given by ball-bearing seat with increased position and an ergonomical handle. Rowing training is considered as one of the most effective types of whole body training in fitness. While rowing, more than 80% of the muscles are demanded and it is still extremely joint-gentle. Rowing machines of First Degree Fitness have been among the most popular rowers in Europe since 2002. 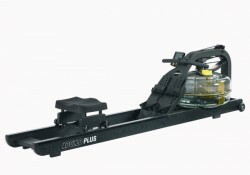 All rowing machines of First Degree are equipped with a unique water resistance system. Water resistance systems basically work infinitely variable, because the user determines the resistance by the energy of his/her stroke. The infinite variation helps you to train as individually as possible and to set different training stimuli. In addition, the basic resistance of many First Degree rowing machines can be additionally controlled. Rowing machines like the E316 and the E520 are extremely loadable and are even equipped with a 16 times or 20 times resistance adjustment. The rowers of First Degree are designed with most modern techniques and are built with best materials. 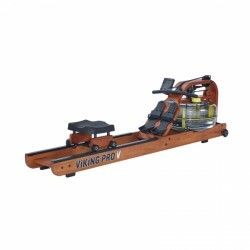 First Degree Fitness offers high-quality wood-manufactured rowing machines (ash wood) like the Apollo Pro. 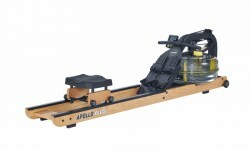 Rowing machines being made of wood and steel like the Apollo Black ddition are also attractive and of high-quality workmanship. Besides high quality standards, First Degree focusses on high practicability of all their machines. All rowers can be space-efficiently folded and are easy to store. Transport wheels on all machines facilitate the transport at home. Another feature of excellent quality is the professional use warranty for machines like the Apollo Pro, the Viking Pro or the Fluid Rower E520. This rowing exercise bikes are ideal for hose use as well as permanent use at fitness gyms, hotels, and rehab centers. Every rowing machine is equipped with a display with different indications as for instance covered distance, strokes per minute, and burnt calories. Hence the training progress can be better measured and evaluated. Professional machines like the Apollo Pro have additional multimedia functions and can be connected via a USB plug with the laptop or the computer. First Degree focusses on very effective training, thus the heart rate can be measured with a chest strap while exercising. First Degree represents itself really full of variety as it offers special upperbody exercise bikes. The upperbody exercise bikes E629, E820, and E920 are especially designed for the strength-cardio training of the upper body. Either home fitness, rehab training or competitive sports – A First Degree rowing machine is a customised, first-class fitness machine!